I have no idea what that means, but I feel cheated by not getting to play “free love ball field”! 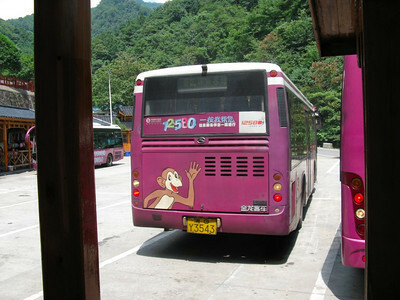 The tourist buses in Zhang Jiajie fly down narrow roads like an amusement park ride. I clearly remember zooming past one vertical drop and thinking “I’m glad this is a one-way road” when another bus rounded the corner in the opposite direction. It wasn’t a one-way road. Nobody slowed down. One of these rides between parts of the park was the first time I’ve ever gotten to see — and hear, and smell — an airsick bag being used on a bus. With all the thousands (perhaps tens of thousands) of tourists I saw over a week in Hunan province, I saw precisely two who were non-Asian. It was a retired-looking couple, both wearing binoculars, in Zhang Jiajie National Park… I suspect they were birdwatchers. Could have been American, could have been Western European. Everyone else was from China, or Korea, or Malaysia, or somewhere else close by. One of the ways you know you’re not at home: at dawn, the street-cleaning trucks came by, playing an electronic version of “Happy Birthday to You”… over and over and over.